Tucson's new normal: 115 degrees and more? 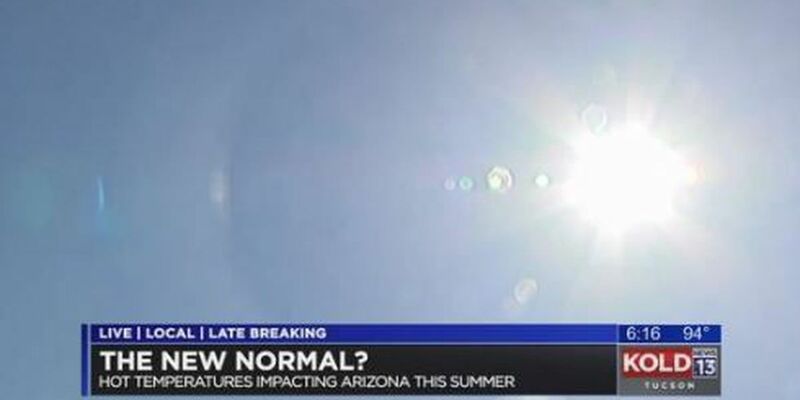 TUCSON, AZ (Tucson News Now) - Tucson saw consecutive days this month of temperatures of 110 degrees or higher, reaching as high as 115 degrees - breaking records. The summer in Arizona has been taxing for the people who live here. The question now is whether what we're seeing could soon be a new normal for us. Renowned University of Arizona climate scientist, Dr. Jonathan Overpeck, has looked at what is here and what is coming our way. "2016 is going to break the record for global warmth that was set in 2015, that was set before that in 2014, that was set before that in 2010 and in 2005. So in other words we're just getting more and more record global warmth," said Overpeck, who is a UA Professor of Geosciences and of Hydrology and Atmospheric Sciences. Overpeck said we're seeing the effects of climate change around the globe and here in Arizona. For instance, Arizona winters are getting shorter, causing some problems. "Earlier fire season, wildfire season, hotter wildfire season, more wildfire. It's also hurting our snowpack. Snow's melting earlier because the winter's ending earlier and that means less water in our rivers," Overpeck said. He said tropical diseases are migrating, moving north. Overpeck said countries around the world, including China, have agreed to cut greenhouse gas emissions. He said the other choice is to do nothing and hope the warming stops. Overpeck said Arizona has warmed about 2 degrees since 1900. "Our big heat waves in Tucson won't be 115, 117. They'll be 130. And that means we're going to have more than 100 days, probably pushing 150, 200 days a year above 100 degrees," Overpeck said. He said the science shows greenhouse gases enhance natural global climate change. He said we also have the science to solve the problem. However, the temperature's upward trajectory will take time to stop. What is the new normal we can expect? "(It will not be) long before we start breaking 120 in Tucson and maybe even 125 or hotter in Phoenix. So that's the new normal that we have to get used to," Overpeck said. "(We'll) probably continue to warm until about mid-century, but slowing down as we reach that point where we stabilize things. And then we're stuck with that climate for hundreds of years." He said Arizona is adapting and can continue to adapt, even taking advantage of the movement away from fossil fuels and becoming the Saudi Arabia of renewable energy. "Arizona wants to be in the forefront of the jobs that (change is) going to create. We can do that because we have abundant solar energy in the state and we also have good wind in the northern part of the state. We can come out of this being a net winner in terms of jobs," Overpeck said. It's a new normal that can benefit our state as things heat up.